If you are a superhero, you probably don’t have time to waste. You need an efficient and straightforward framework that helps you achieve your goals in a timely matter. A few years ago, I was working at a major Montreal-based media company as a user experience specialist when my attention was suddenly grabbed by three gentlemen leaving the meeting room. They were well-dressed and walked their way to the exit with confidence. This interaction led me to question and seek more information on what is business strategy, and why my manager did not take them that seriously. 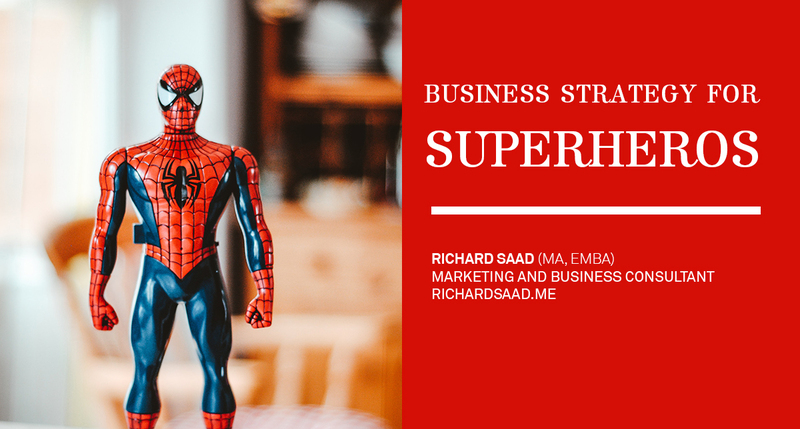 Today, I think the business strategy is the art of articulating the necessary action plan to achieve the business goals in a clear and measurable way. The definition of strategy is the process of planning to produce a significant purpose. Mostly, it is a crucial step for every organization whether it be a startup or a well-established corporation. As with everything else nowadays, the process of strategy is constantly changing and evolving to reflect the ever-changing reality where many procedures are simplified and democratized. Why does the one-page business strategy makes sense? Business strategy should not be complicated; it is about including the critical information in a clear and concise way on one page. The focus must shift from planning to listening to market signals. What is the point in working four to five months on a business strategy when technology is changing at a faster paste? As much as you want to plan, the most effective strategies are those which emerge after a crisis or an opportunity. The point is that business strategy has to evolve, adapt and pivot when needed. Also, the one-page structure and its simplicity allow top management to remain aligned and avoid the misinterpretation of a vague and generic Powerpoint strategy. The One-Pager Business strategy is built on the following three essential components. 1- Define your Objective: As with any strategy, you have a goal, whether it is revenue growth or market share increase. Objectives must be measurable and set in a time frame; otherwise it is difficult to evaluate it. 2- Define your Scope: The scope is the arena wherein the firm will compete. It is based on three main variables: The customers, geography and its products. Is the offering valuable enough for the target audience? Is there another segment that will be willing to pay for your offering? Are there other opportunities in others markets? Are there any types of arbitration opportunities that you can leverage? Are there ways to optimize production? Does integrating or internalizing external tasks help to reduce cost and improve quality? « If you don’t have a competitive edge, don’t compete! » Jack Welch, GE. The competitive advantage is the propeller for success. It helps the organization stay in the game and grow. It is the central pillar of the firm’s value proposition. Do you have a well-established infrastructure and/or network of suppliers that is better than those of the competition? Do you have the capabilities and the resources to do the job better than the competition? Are you building your strategy on your main competence, on what you do best? Is your offering valuable enough in the eye of your audience? How easy is it to copy your offering? Are there substitutes for your offering? The value proposition is the sweet spot of the customer’s need and the firm’s offering that is built on its competitive edge. Because no firm can be good at everything, an organization must decide on the trade-offs. The firm must determine the customer purchase criteria that it is willing to sacrifice and those that are worth leverage. Here is an example of a value proposition model of the three main retailers in the US that illustrate this concept. You map what are the most important customer criteria and compare firms’ positions on each of these criteria. Amazon’s global success is not a coincidence: it is a well-thought out approach to becoming the world leader in online retail, and perhaps offline with its recent acquisition of Whole Foods. The business goal is about growth and market share. Their scope is widening with new target segments. For instance, video/movie lovers can enjoy Amazon Prime and programmers/IT specialists can find relevant solutions with Amazon Web Service. Amazon has built its business model on its competitive edge which is the strength of its infrastructure and it broad network of partners. Hence Amazon’s value proposition is its capabilities to offer an extensive choice conveniently and delivered fast. HILTI is an innovative company when it comes to reinventing the business model of a traditional manufacturer of construction equipment. It has successfully transformed the way it does business by creating a new offering for a new and growing market: those who are seeking rental equipment. Today, HILTI’s value proposition is task-based as opposed to product. In other words, it helps its customer get the job done by renting the tool he needs, as opposed to selling the tool that this customer might use only once. It was a smart move when HILTI changed its playground and moved to a new offering. This latter helped HILTI remain relevant in the very competitive industry. This change in strategy couldn’t be possible if HILTI did have the credibility and the network of partners to pull this off. Business strategy shouldn’t be a complicated process; it can be a simple one-pager as long as it lists the essential elements listed above. The simplicity of a one-pager strategy forces executives to be concise and straight to the point so it is easy to remember. Strategies are not only planned but can emerge after a particular circumstance. Therefore, the focus must be balanced between strategy planning and strategy capturing. The one-pager format allows an easy update when needed.